Gabriel Pacheco is a Mexican painter and illustrator known for working in the Surreal Visionary style. Born in Mexico City, he began his career as an illustrator when his sister asked him to illustrate a story she had written. Since then, he has become widely known for his work illustrating children’s books and has even taught classes on that subject in Mexico, Spain and Italy. His simple, haunting style is populated by romantic and intense characters and a soft surrealistic ambience. He is fond of vivid patches of colors on simple backgrounds and a strong use of precise, sharp lines. His work is inspired by Hieronymous Bosch and Marc Chagall, although it can be said that he is also influenced by the styles of Hans Christian Andersen, Rudyard Kipling, Edgar Allen Poe, Lewis Carroll and other writers and composers whose work he has brought to life in his intriguing illustrations. Viva, Pacheco! See more of his work by checking out the gallery after the jump, or by visiting his interesting blog, which, not surprisingly, is a true mix of art of literature. 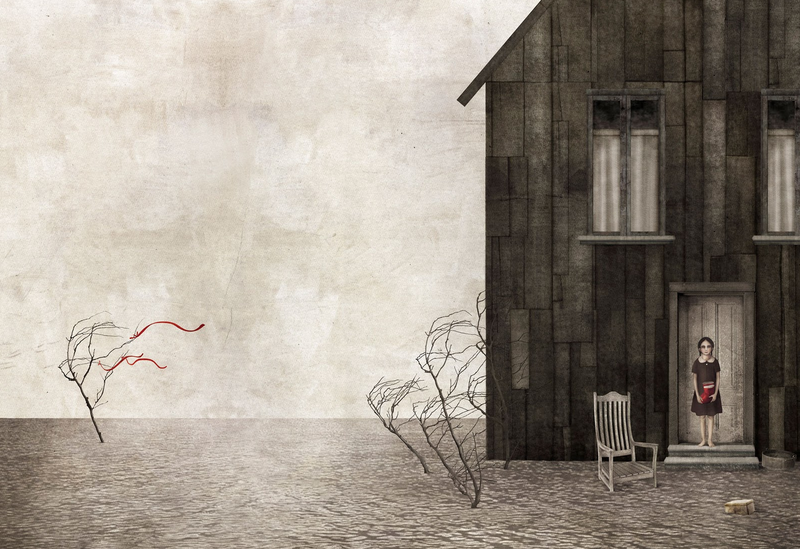 This entry was posted in Art, Weekly Art and tagged Art, Artist, Gabriel Pacheco, Mexico, Surrealism. Bookmark the permalink. I like Pacheco’s work that you posted. Thank you Stephen! The sheer variety of different things which yet feel something alike in their artistic themes is truly astounding! Viva Pacheco indeed. He are a really interesting artist, because he do a mixture of motives – some are a bit macabre, some very romantic and fairy tale – then there is the drama … small and big. My favorite is the ship and houses, even if it’s a bit dark – but I also like the big blue with the shell. The one with the man with umbrella – I would like very much to have on my living room wall. A really great artist. Thanks for sharing. What an intriguing style! “Haunting” is the perfect word to describe it.